This post is written by Dillon Blankenship, one of our Hubbard Fellows. Last weekend I drove back to Arkansas to attend a wedding. It is a sizable drive (approximately nine hours from Wood River), but is manageable with a sufficient supply of snacks and music. The trip went smoothly enough and, with the recent honing of my plant identification skills, I was more aware than ever before of the interesting flora to be seen from the interstate. Of course, much of the scenery included corn and soybeans, but there were also many “wild” plants along the way – goldenrod, sunflowers, hoary vervain. Missouri’s I-29 was lined with Illinois bundleflower. 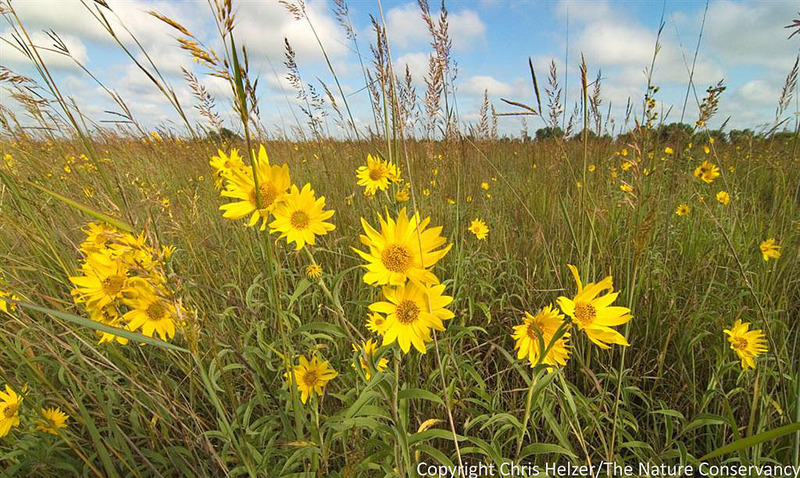 Maximilian sunflower (Helianthus maximiliani) is a native wildflower commonly seen in roadsides this time of year. Unfortunately, there were a lot of sinister plants to be seen too. Musk thistle, drying up now, sloughed its last seeds into the wind. Old stalks of teasel formed highway-side monocultures. Sericea lespedeza engulfed the road edges and outcroppings as I entered the Ozarks and I was welcomed home by a new patch of Queen Anne’s lace beginning its invasion of the field by my house. I acknowledge that there are some differences of opinion on exactly how invasive or detrimental some of these exotics are, but given the large amounts of time I have devoted to invasive species control thus far in the fellowship, this sea of weeds was a depressing thing to behold. These plants were not new to my journey. They were likely there when I first drove to Wood River to interview for the Hubbard Fellowship in February, and they were certainly there when I drove back to Arkansas in June. The difference is that now I can spot these wounds a mile away (I literally see them in my sleep). When I passed them just a few months ago, I had not yet been educated by my mentors at the Platte River Prairies, nor had I invested so many intimate hours into working with these plants (as I spaded and sprayed their cohorts into oblivion). 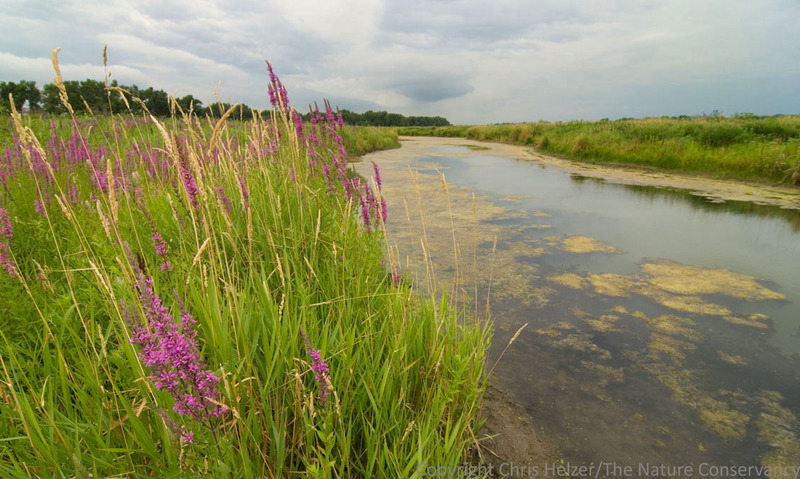 Purple loosestrife and reed canarygrass on the bank of the Platte River. Even so, now that I am aware of the damages, I do not think I should shirk away in depression or ignore the problem to save my sanity – this assertion goes beyond the scourge of invasive species to encompass all the other wounds out there. As Leopold continues, you have to know to see, and then you have to study so you can formulate the best prescriptions possible for healing the natural world. This entry was posted in Hubbard Fellowship and tagged aldo leopold, dillon blankenship, fellowship, hubbard fellowship, invasive plants, nebraska, platte river prairies, prairie, the nature conservancy, world of wounds by Chris Helzer. Bookmark the permalink. Great Post Dillon!! I feel your pain on seeing these invasives behind the eyelids. Great post! The million dollar question is, how do we get these “wounds” or problems to be seen by the “laymen”? We must get others to see that there is a problem before it can be fixed on a wide scale. When you cannot save everything, you should be content to be able to say that you did all you could. Being an eloquent writer must be one of the criteria for your fellowship. Thanks for the post. Sending good luck wishes your way. The more I learn about nature the lighter my foot print becomes. I’ve struggled with this same agony. And the complete blindness of others dumbfounds me. My most difficult observations are when the price of corn goes up and what little prairie that is left, even the most erodible parts, go under the plow….all for a few more ears of corn and a few more dollars. About 5 years, we made a trip to the Black Hills in South Dakota. We always go through the Badlands south of Wall Drug. To my dismay, everything was covered with Yellow Sweet Clover. My thought was that the government entity in charge of seeding actually specified this be done. Do you or anyone else know this to be true? You took the words right out of my mouth! Super well-written reflection on a new/heightened awareness I imagine all past and future Hubbard Fellows will be confronted with. Beautifully and well written Dillon…..and all who commented. It is the path of knowledge that opened our eyes to see the seemly innocuous invasives for what they truly are. If only we had remained blind to this….but then we would not have seen the truth and become part of the solution. Never forget the power of one, Dillon. Concerted and consistent effort, over time, even by one person, can produce significant and lasting improvements to the landscape. The problem is usually our own impatience. Love the learning, enjoy the journey, and listen and look to the many living things that thank you in their own way for your efforts. Excellent post, Dillon. That is one of my favorite (and among the saddest) Leopold quotes. A world of wounds, indeed.